The Babolat Propulsion all-court shoe uses a concentrated dose of high-tech power for the very top of the range! Intended for expert players looking for unmatched performance. Exceptionally dynamic response with the special Side 2 Side system in the forefoot. Outstanding foot support thanks to the Lateral Stability System which provides vertical stability and lateral support. Kompressor system heel cushioning is made with EVA cushioning and TPR (Thermo Plastic Rubber) filled tubes inside the rubber to absorb shock when the foot hits the ground. Foot Belt Technology provides instep support, ankle support and heel support while enabling players to enjoy a custom-fit shoe. Cell Shield upper cellular material makes this shoe very durable without losing it's softness. The mesh lining keeps the foot very well ventilated. Michelin Optimized Cell System 2 outsole provides excellent traction and energy transfer. Directly inspired by the Propulse shoe, the V-Pro All Court 2 offers high performance technology with excellent comfort and a fit adapted to a women's foot. Exact Pro System provides lateral relaunch and velocity to ensure faster footwork, better reaction time and tighter, more precise and efficient footwork. 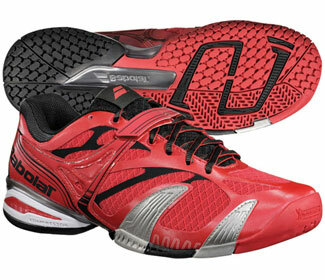 Kompressor System shock-absorbing heel provides long lasting comfort. Optimized foot hold thanks to the asymmetrical collar adapted to the foot's anatomy. 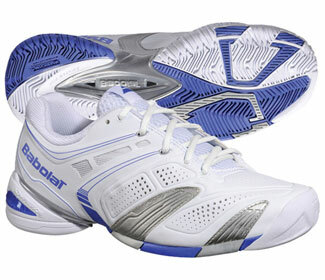 This shoe gets you closer to the court so you can really feel it! More durability on the high wear area on the inner edge with the Pro-Shield reinforcement. Michelin All Court sole provides resistance to abrasion and extra versatility giving players the highest performance over a longer period.